A recent North Korea TV documentary suggests that Kim Jong-un is in poor health. Kim Jong-un, the supreme leader of North Korea, has not been seen recently. There was speculation for some time that Kim’s absence from the spotlight was due to illness; this was effectively confirmed by a documentary produced by North Korea’s state media. The documentary acknowledged that Kim was in a state of “discomfort.” Recently, according to the Associated Press, Kim missed a meeting of the North Korean Supreme People’s Assembly that he was scheduled to preside over, prompting further speculation that the leader’s health may be in question. “The wealth and prosperity of our socialism is thanks to the painstaking efforts of our marshal, who keeps lighting the path for the people, like the flicker of a flame, despite suffering discomfort,” the documentary voice-over declared, according to Reuters. This documentary narration, detected by Reuter‘s James Pearson, is the basis of the current theory that Kim Jong-un is ill. As Adam Taylor notes in the Washington Post, “discomfort” in itself is not a particularly telling adjective. Michael Madden, an expert on the North Korean leadership and North Korea watcher for 38 North, told Reuters that Kim may have gout: “Based on his gait, it appears he has gout – something [due to] diet and genetic predisposition that has affected other members of the Kim family.” Adam Cathcart, another North Korea watcher for SinoNK, notes, “Any perceptive viewer of the evening news within the DPRK will already know that Kim Jong-un has been limping about, even requiring the use of a golf cart on several occasions.” Given these prior observations, it seems credible that Kim Jong-un is not 100 percent physically fit. Kim was last photographed in the public eye at a concert on September 3. As early as July, he was seen walking with a limp. 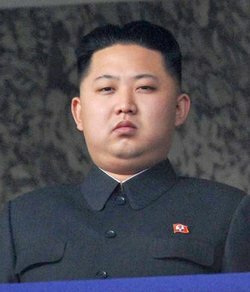 Since coming to power, Kim has gained considerable weight and speculation about his health has been going on for some time. With this week’s evidence, it turns out that there may be some truth to Kim’s absence being precipitated by poor health. His father, Kim Jong-il, died of a heart attack and was known to be in poor health himself. The ramifications of Kim Jong-un’s poor health are impossible to pinpoint, but if, as speculated, there are indeed anti-Kim factions within the North Korean senior leadership, now may prove as good a time as any for an attempted power struggle or coup. When Kim Jong-un executed his uncle and regime number two Jang Song-thaek late last year, it became clear that he was concerned with a potential second locus of power emerging within the highest levels of North Korean leadership. Toshimitsu Shigemura, a professor at Waseda University in Japan, is one of the proponents of this theory: “Another reason why Kim may be reluctant to appear in public is the ongoing power struggle inside the North Korean military, which means that the situation in Pyongyang is still unstable.” Kim, who is considerably younger than many of his father’s cadres who remain involved in the senior leadership, may be seen as an inexperienced leader. As always with North Korea, the usual caveats apply — it is almost impossible to verify what is going on at the highest levels of leadership. What is effectively confirmed for the moment is that Kim’s speculated health problems are real enough to prevent him from appearing publicly from almost a month. Why Was Kim Jong-un's Older Half-Brother Reportedly Assassinated? Kim Jong-il's oldest son was assassinated, allegedly by North Korean agents, in Kuala Lumpur, Malaysia.